Sometimes, even the best oral habits and daily brushing and flossing can’t prevent the natural discoloration of your teeth over time. Your age shows all over your body, from smile lines around your eyes to your grey hair. Your age can even show in your teeth. Simply put, younger teeth look whiter while older teeth take on a dull, yellowish appearance. Everyone loves a bright white smile, and there are a variety of products and procedures available to help you improve the look of yours . To achieve a whiter smile, teeth whitening is one of the easiest ,effective and affordable methods around. There is a huge range of over the counter teeth whitening products sold in pharmacies and supermarkets. Over-the-counter teeth whitening methods can remove minor surface stains, but many patients are disappointed in their results. The concentration of peroxide in these products is so low; they can only lighten your teeth by one to three shades. Often, even this small amount of whitening takes months to achieve. 1. Take Home Method – takes 7-10 days for best results. 1. Take Home method Visit 1 – Impressions are taken of your teeth using special “putty”. Visit 2 –Custom Teeth Whitening Trays are fabricated for your upper and lower teeth. The dentist will give you detailed instructions on how to apply the whitening gel and place the trays in your mouth. When time is critical or you are just ready to have your new smile right now, in-office whitening can dramatically whiten your teeth in just over an hour. A professional cleaning procedure may be advised to help the treatment penetrate deeper and more evenly. Zoom! WhiteSpeed, is the newest generation of Zoom whitening which now uses blue LED technology that is used to activate the gel and irritation is minimal. This light is used in several 15-minute increments, during which time the gel is allowed to penetrate deep inside the enamel of the teeth. After the treatment, our dentist applies relief gel to reduce post-procedure sensitivity. When paired with take home trays for additional whitening, your teeth can be touched up every 6 months to maintain their whiteness. 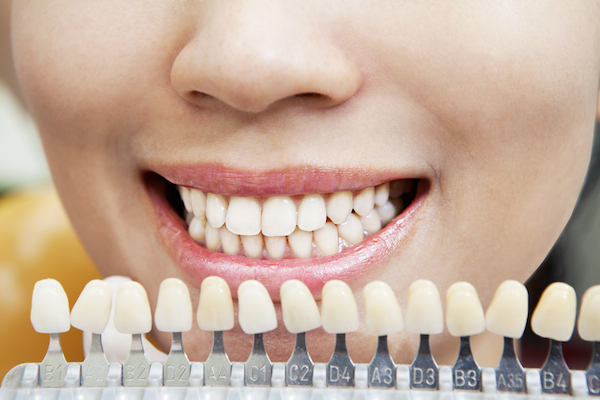 Many people have their teeth whitened before a big occasion such as a wedding or birthday. If your smile says dull instead of dramatic, don’t let it get you down. We encourage you to schedule a teeth whitening consultation. Although both methods are effective, some discolorations simply cannot be removed from the enamel. In cases like this, other cosmetic dentistry procedures, such as cosmetic bonding or porcelain veneers might offer an effective solution for obtaining a bright, beautiful, youthful looking smile.